Herschel is a feisty little puppet dog who learns about economics, thanks to his friend Dr. Day. In these two DVDs, Herschel learns basic economic concepts and goes into business. 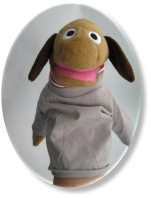 If your kids like Herschel, and you want to use him to teach your students even more, you can order your own Herschel puppet. Act Out Programs on the Original DVDs: In pairs, have students act out some of the scenes they saw on the DVDs. This is a great way to reinforce the basic concepts, and is an excellent activity for a learning center. "Hi, boys and girls, what were some of my economic wants?" "What were some of the goods that I wanted?" "What were some of the services that I wanted?" There are also several questions from the Herschel Teacher's Guides (Original DVD or Herschel Goes into Business DVD) that you can use. "When I had to choose which candy bar to eat, I was facing what kind of economic problem?" "What is one of the four characteristics of money?" "When Molly traded a doggie treat to Spot for a baseball card, who benefited, Molly, Spot, or both?" "Instead of taking Dr. Day's advice to advertise, what did I decide to do instead?" Identifying Specific Goods and Services: Have Herschel describe a specific good or service. (This activity could also be used to describe particular productive resources.) Students in the audience must tell: a) what it is and b) identify it as a good or service. Before this activity begins, for an assignment, each student should come up with 2-3 questions, then can take turns being Herschel. To make it more exciting, add a bit of competition. Divide the class up in teams and see which team can get the most correct answers. In fact, team competitions can be used for several of these puppet-teaching activities. Identifying Other Economic Concepts: The Identifying Goods and Services Activity above can be modified to teach other economic concepts introduced in Herschel. For example, Herschel could ask similar questions about the different kinds of productive resources. "What productive resource is wet and is needed for life?" "What productive resource does a carpenter use to hammer nails?" What kind of productive resource gives you a shot at the doctor's office? a) nurse b) human resource. Ask Herschel a Question: As a twist on the activities above, have students volunteer to be Herschel. Then the teacher or other students can ask Herschel a question, such as, "Herschel, is a shirt a good or a service?" The teacher, posing as Herschel, can purposely answer incorrectly, adding a lot of humor. Have Older Students Use Herschel to Teach the Younger Students: The old adage is true: you learn something best by having to teach it. So why not have some of the older students teach the younger students? Using the Herschel puppet is a perfect way to do this. The older students could do several of the teaching ideas mentioned here, but could also create their own teaching ideas. Creating More Herschel Episodes: Place students in groups. 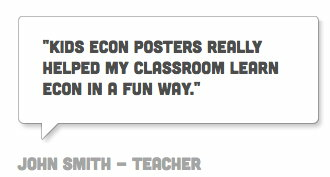 Give each group several of the KidsEcon Posters describing various economics concepts. Have each group write a new episode featuring these concepts. The students would write the dialog/script and have members of the group act out their episode for the rest of the class. Students could even videotape the new episodes and make them available for other teachers and classrooms. Videos could also be entered in a contest much like the Economics Calendar Contest. Herschel Goes Comparison Shopping: As a special assignment (perhaps on week-end), have a student or pair of student (along with Herschel!) visit a store(s) and compare brands of dog food, treats, doggie toys, dog bowls, etc. The students could make a chart of their findings, such as the difference in prices for different brands, different types of doggie products, and price differences at different stores. Students should write about the trip and give a report to the class. A special "Herschel Backpack" or other type of carrier could be purchased to transport Herschel safely to and from the classroom. Producing Doggie Treats: Classes with classroom businesses could produce doggie treats. There are many recipes on the Internet. The Herschel puppet could be used in the marketing and advertising of their product. (Herschel says, "Our treats are YUMMY", etc.) Students could produce posters and write advertisements featuring the Herschel puppet that could be put up around the school or read on the morning or evening announcements. Read a Story to Herschel: Read, or have students read, a book listed on the Literature Connection [link]. Make sure students know the answers to the economics-related questions on that particular book given on the web site. Then, have a student read the book to Herschel. Have the student ask Herschel the questions and see if he knows the answers, or have Herschel read the story and ask the questions to the students! Using Herschel with Other Curriculum Materials: Why not include Herschel as you play KidsEcon Posters Bingo? Herschel could call out the concepts or just have his own card and play along, complaining, of course, if he doesn't win: "It's not FAIR!"